I’m delighted to work with ShadowCatcher Entertainment on this play which means a lot to me. I feel a sense of responsibility to the incarcerated men I’ve come to know and care about. ShadowCatcher is helping to make sure the play has the widest possible reach. For that I am so grateful and excited. Rattlestick is honored and privileged to work on Lockdown with ShadowCatcher, a bold, risk-taking company that shares our commitment to playwrights and launching original, authentic and dynamic new theatrical works. ShadowCatcher is proud to announce its partnership with Rattlestick Playwrights Theater on the upcoming world premiere production of LOCKDOWN by Cori Thomas. Presented in Partnership with Drama Club, Fortune Society, NYC Together, PEN America Prison and Justice Writing Program, Project Liberation, and Rehabilitation Through the Arts. ShadowCatcher's support of LOCKDOWN reflects three vital components of our mission: to support new plays for the American stage and singular playwriting voices like Cori Thomas; to uplift stories that resonate with our times and illuminate the human condition with an empathetic and redemptive spirit; and to enhance the scope and impact of our work through partnership with similarly aligned institutions and organizations like Rattlestick, The Fortune Society, and all our valued community partners on this project. TP: Prior to writing LOCKDOWN, did you have any personal experience or particular interest regarding the subject of incarceration and the criminal justice system? CT: No - aside from just hearing about stuff on the news, and reading some famous true crime books in the past: In True Blood and Helter Skelter, that sort of thing. I will also admit I always like a good detective whodunnit, but truthfully, it was not a subject on my radar. TP: LOCKDOWN is an outgrowth of your experience as a volunteer at San Quentin State Prison. How did that opportunity come about, and was it your intention going in to write a play based on your experiences there? CT: No, it was not my intention at all. I actually only very recently became a real volunteer with a program called No More Tears (https://www.nomoretearssq.com). I was in San Quentin originally one afternoon for another totally unrelated project, but while there one of the incarcerated men (Lonnie Morris - age 67, incarcerated 42 years) came up to me and asked me what I did. I said I was a playwright and he asked me if I would help him with a play for a program he had started there that puts a face on violence in order to prevent recidivism. So it was arranged that I would be coming in there to work with him on this play we would write together for No More Tears. We are still working on it. I wanted it to be a documentary-style piece so this has required hours and hours of transcribing which can only be done there as I can’t take anything out. I was already commissioned by Rattlestick Theater and had decided to write a play about prison after the one visit and before ever beginning to work there. So while the play did not grow out of the experience there, it has most certainly been enhanced by it, and would otherwise not be what it is. What happened is that once I started going inside and spending time, I realized how unauthentic the play I was writing was and asked the men if they would help me. LOCKDOWN is a work of fiction. But everything in there is based on truth and has been vetted. The men generously opened up to me about their lives - one man even gave me vocabulary lessons. Lonnie has read every draft and is unforgiving if any detail is not right or is corny! It has been a group effort with all of them graciously willing to answer millions of questions. They are all so excited about LOCKDOWN. I hope fervently we can find a way to tape and bring it in so that they can see it (I think it requires a fee to Actors Equity and permission) or can arrange a performance there. Or both. TP: You and I have talked about the irony of San Quentin becoming a kind of "happy place" for you, to the point where you eagerly anticipate your visits and reflect on your time spent there in almost joyous terms. I'm sure this must coexist with a measure of pain, frustration and sympathy for the incarcerated men you've befriended there, but I'm curious about the aspects of your time spent in the prison environment that stimulate and inspire you, that keep you coming back and leave you feeling uplifted by the experience. CT: It’s less about the environment and all about the people I have had the privilege to meet. I have come to know such amazing and inspiring people. I feel they all have something of value to offer society and the world, and it pains me that so many of them have very little chance of ever seeing freedom because of the current state of affairs regarding law and parole, etc. Communication is near impossible with a person in a prison. I can’t call them. And as a volunteer I am also not allowed to write. I have from time to time mailed a manuscript to Lonnie, just the loose pages with a “please read this” Post-It stuck to it, so he could go over them. The prison frowns on over-familiarity, which makes absolute sense. It would not be healthy to get attached to any one person in particular. Truthfully, it’s a good rule to follow in any work scenario. I work closely with Lonnie on our projects having to do with his program, but there are an additional 30-40 men I’ve come to know quite well by now so there’s little danger of that. I help a lot of people with various projects. When I come in, they all want to show me new stories, and scripts they’re writing so I can give them feedback. I listen to songs they’ve written. See short films they’ve made, etc. There are so many brilliantly talented people locked up in this country. The only way I can interact and work with them is by actually going inside the prison. TP: Is there a particular real-life experience or relationship you've acquired during your time at San Quentin that motivated your desire to create greater understanding around the issues of incarceration and the criminal justice system through this play? CT: Well, I am very focused on the issues of re-entry and trying to help the public see these men as valuable members of society. Citizens who have rights and should be respected. I think that once you’ve done your time, you should be given a fair chance to really start again. Unfortunately that is not the case. I think that the more I can help to humanize people who are incarcerated, the more they are seen as “real” people like you and me. The easier it is to accept them back into society. TP: LOCKDOWN examines the hardship of mental as well as physical confinement. Can you talk about how that juxtaposition plays out in the story? CT: I don’t like to give away details of the story. I am always someone who likes to see a play without really knowing much about it and like for my plays to be experienced that way too. But I’ll say that there are many different sorts of prisons, and some emotional prisons are as confining as physical ones. TP: Would you say there were any unique challenges to your work on LOCKDOWN, as opposed to previous plays you've written? CT: It’s a play about a subject I learned about as I was working on it. And a subject that was not one I was familiar with really at all before beginning the work. I think what is most interesting is that I feel it is a play I’ve written to honor some very amazing men I’ve come to know. So usually I am excited for myself and have a sense of accomplishment that is my own. In this case I feel a sense of responsibility to them. I know without their help this play could not have been written as it is. TP: What do you hope audiences will take away from their experience of LOCKDOWN? CT: It is my hope that they will better understand the realities an incarcerated person faces. I also hope they will see their humanity and that they are capable of redemption. My goal was to make sure they were depicted as accurately and authentically as possible so the public can leave having seen them as I do. I wrote this play from a place of respect and honor. I hope the audience will understand and recognize all of our (universal our) desire to live meaningful lives. ﻿Lockdown takes an authentic, intimate and powerful look at the impact of long-term incarceration and the reality of what life inside prison is really like. 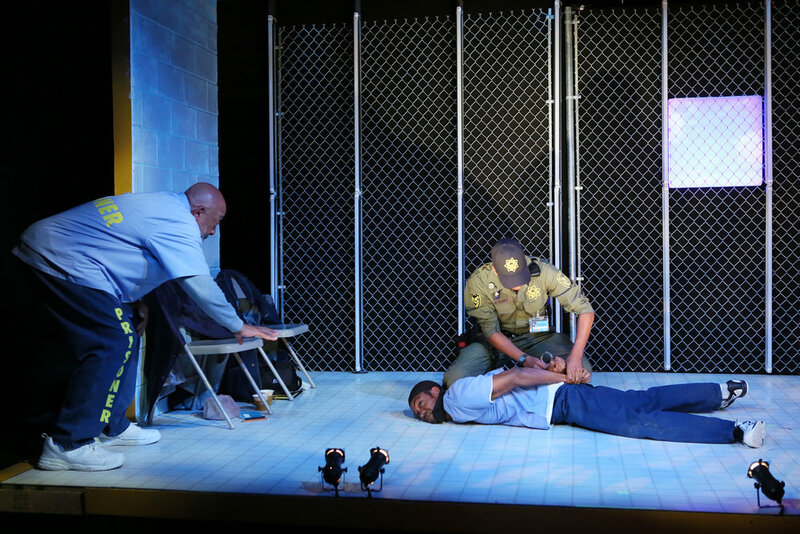 Inspired by Cori Thomas's time with people serving life sentences at San Quentin Prison, Lockdown explores the possibilities for transformation through human connection.